Ryson Mass Flow Spirals handle full and empty bottles, cans, jars, and other similar containers. They are frequently used in beverage, recycling and similar operations. In this system, loads are conveyed up or down in a continuous mass flow. Ryson Spirals have a small footprint and provide considerable space savings compared to conventional methods. Mass Flow Spirals are based on the already proven and reliable Ryson Spiral technology. Only one drive motor is needed, equating to substantial savings in controls and systems integration. Ryson Spirals are designed for low maintenance and long life. Many spirals operate 24 hours a day, 7 days a week. The Mass Flow Spirals are equipped with extended in and outfeed tangents to facilitate smooth side transfer to and from external conveyors. 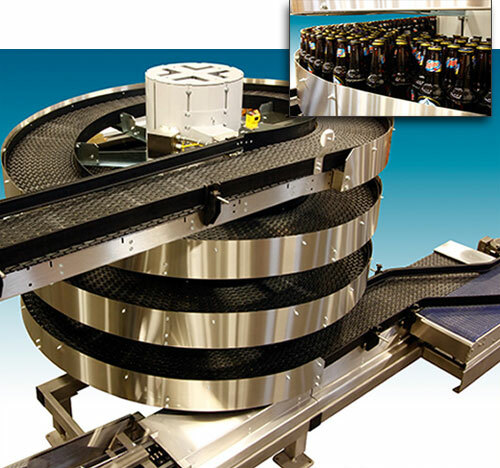 They can be delivered with 12”, 16” or 20” wide slats with capacities up to 800, 1,200 2,000 bottles or cans per minute. They are also available in powder coated carbon steel, stainless steel and washdown versions. Above: Spiral conveyor for beer bottling operation. 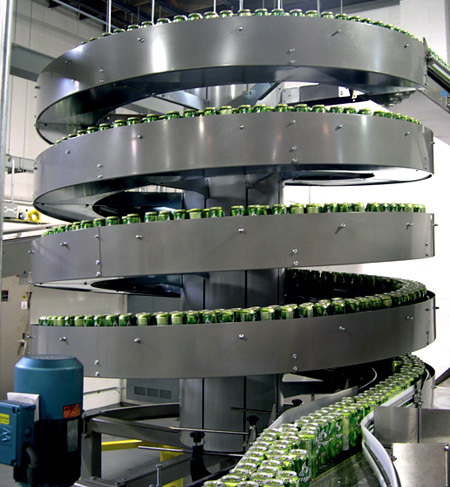 Above: spiral conveying system with soda cans provides fast, accurate product flow.